QUESTION: Do you consider tack on a hunter? 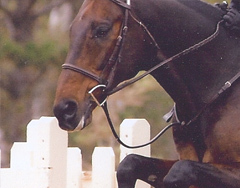 Do you care if a horse goes with a running martingale? Do you weigh the fact that a horse goes with or without a standing martingale? Likewise, do you credit/penalize a horse showing in a snaffle bit versus another bit like a pelham? Trainers and riders use various bits, aids and tack in order to maximize their horse’s way of going, jumping style and rideability. Regulation snaffles, pelhams and full bridles, all with cavesson nose bands, are allowed. Judges may penalize for non-conventional types of bits or tack. Given the range of equipment allowed, our experts comment on the tack they prefer used on a hunter, the equipment that reveals a problem or vice, and their preferences, if any, in bits.